Jessica Mahoney (JM): Hello Max. I am happy to have the opportunity to talk with you. ME: In a moment I’d like to talk about some of your art, which I find interesting in the way you use photography—the employ of feminine forms, but first I’d like to ask how you got into digital art? JM: Well, I began with a BFA in traditional photography and a minor in digital art. After a year in the workforce I realized that digital art was just as strong a part of my life as photography was and I decided to go back to school to spend time focusing on my digital body of work while receiving my MFA. My initial attraction to digital art came through the use of Adobe Photoshop and the magical process of being able to transform my traditional photographs, but also the fact that I could then use the flatbed scanner as a type of camera as well. Both degrees were received from Bowling Green State University. ME: Art Digital Magazine, also known as AD Mag, was created in 2008 as a digital publication to showcase artists working with digital mediums. And yet, like myself, there seems to be a separate group of artists who are using a variety of mediums, incorporating the digital seamlessly into that which pre-exists. I came up with a theory called TADAE, because I felt that the existing language was inadequate. Your thoughts on this? JM: It has always been hard for me to define myself artistically because of my use of digital and traditional materials. What I do cannot be defined as a purely digital medium, yet the term mixed-media somehow didn’t capture it fully either because it seems to imply the mixing of traditional media. So, your theory, though a bit complex, does seem to help with the identity crisis some artists are experiencing. ME: In addition to being and artist, you are also an educator? Could you tell us about that? Too, it is also my observation that many artists in the digital-age are involved with art at many levels, whether they are writers like me, or they are professional educators. It’s as if it is not enough to stop at simply being an artist. Yes, no? JM: I am an Assistant Professor at Ashland University in Digital Arts and Foundations. I feel that being involved with education is a wonderful benefit in that it not only allows me the time and support to create my artwork, but teaching is also the best way to learn. Every situation my students encounter forces me to question my own approach to, and thoughts on, art as well. Realistically, although I enjoy what I do, being employed outside of the purely artistic realm is a financial necessity as well. I think that as a responsible adult who needs to pay the bills simply being an artist at this point in my artistic career would be a very difficult thing to achieve. ME: Digital Art Revolution is the website where I initially discovered your work. At first I was under the impression that the project was some sort of book collaboration that a group of artist worked on together, however after meeting Ligon myself, I know otherwise. He just completed an article for AD MAG. 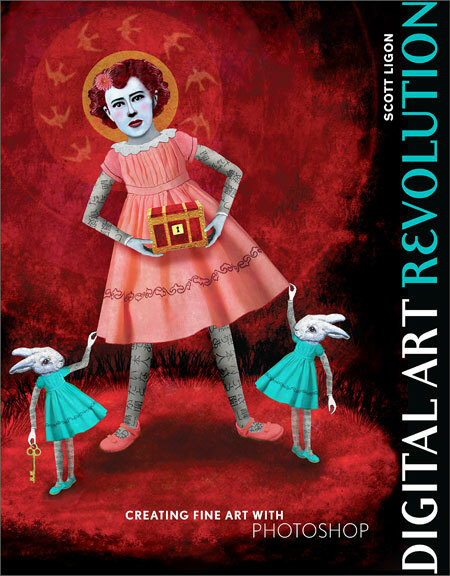 JM: I was contacted by Scott Ligon, the author of Digital Art Revolution, about being included in his book. Ligon is currently an artist and professor at the Cleveland Institute of Art, His overview of the book is that it is, “a book about creating digital art in Photoshop and developing a distinctive, personal approach to digital artwork.” The book contains information about digital artists around the world and discusses digital art technique in relation to fine art practices. ME: So what about education? I’m not sure of your age or race, yet do you find that age matters when it comes to who feels most comfortable with a digital environment? I ask this for a couple of reasons. One is that I’ve discovered in my own research that Blacks are less likely to have access to computers and broadband than Whites. And I recently wrote an article entitled “Electronic Apartheid” about the ethnic aspect of that subject, and I’ve also just read an article entitled “On the Front Lines of the Digital Divide” by Susan Nemitz—Library Director of Ramsey County, in the Minneapolis/St. Paul area—about the age aspect of that subject, the digital divide. This month—March—is Women’s History Month, which brings up the other reason, that I’ve found in my capacity as the editor and publisher of this magazine, it’s harder for me to find a balance of women to interview, in comparison to men. Most alarmingly, in the last year or so, I haven’t been able to find a single prominent black woman in this arena, although I did interview a woman of Asian-American decent recently. I realize this is a complex question, but take a stab at it if you will. Where to do you see the digital with age, race, class and gender? JM: You are correct – it is indeed a complex question. Speaking from personal experience in the classroom and in the professional art realm I am surprised to learn that you have had problems finding female artists to interview. I have found that the number of females that have participated in conferences, gallery shows, and as students in the classroom have often times matched if not outnumbered the male population. My experience in the classroom with race is a difficult one to assess because I teach at a small university with limited diversity. As far as age is concerned, it all depends on accessibility to the technology. I have been introduced to the work of quite a few older digital artists over the years and am always amazed how readily they seemed to have transferred their creative curiosity from traditional media to digital media. With such a large topic here I feel my answer is just scratching the surface but hopefully this answers your question in part. ME: I was stuck earlier when you said “teaching is the best way to learn.” It’s an interesting thing to say. How did you arrive at this view? JM: When I am teaching a subject, I try to anticipate what types of questions the students may ask. In doing so, I often research subjects more thoroughly than I would otherwise have a need to. I may know a lot about a particular subject matter, but many times while creating I operate in a very intuitive manner. Having to articulate this information while teaching, encourages me to think about things from a more analytical perspective. ME: So let’s talk about some of your work. You are a photographer, and in looking at your images, I would say that’s fairly obvious. And yet the expressiveness of your work is unique. Could you talk about the “Holding Pattern Series”? What’s going on there—what’s that woman doing standing around in all those juxtaposed positions? JM: “Holding Patterns” references the circular pattern that planes are forced to fly in when they are waiting to land. This struck me as a perfect metaphor for those times in life when one feels that are stuck between points A and B – existing in a perpetual state of in-between The diptychs and sequences in “Holding Patterns” explores the tension that forms when you don’t have your feet planted firmly in one place or the other. 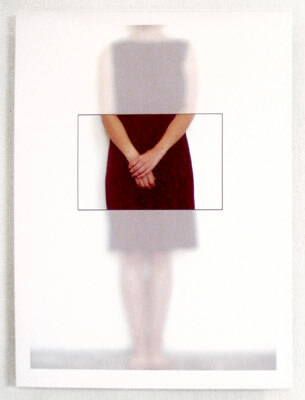 The female figure’s face is never seen because the photographs are more about her actions rather than her identity. The actions of spinning, walking in opposite directions, or wringing one’s hands are all psychological portraits of sorts, as are the empty spaces left behind. ME: You prior mentioned employing scanners as a type of camera, which by the way I’ve begun to think of all capturing devices as photo-imagers or capturers. I know well what a scanner is and does, but perhaps for those less familiar, how is it different from a camera, and what can it do that a camera does not? JM: Flatbed scanners have a much shallower depth of field in comparison to a camera. Because of this limitation, scanners are best used to capture texture and surface details while a camera can be used to depict foreground, middle ground, and background within an image. One can capture some amazing detail with the macro settings on a camera but the scanner allows that detail resolution to be manipulated to a much greater degree – giving the user the ability to enlarge minute details while maintaining crisp image quality. ME: I love the piece “Looking Back on Tomorrow” and the piece “Kinetic Journey: Exploration through Memory.” They are both like sequences or flashbacks through one’s life. What’s this work about, and are we seeing both the camera and scanner at play here? JM: These wall installations were both created using video stills of digital video I shot while in Italy during a study abroad opportunity in grad school. I had taken a class the semester before called “The Art of the Sequence”, which had brought my interests in the connections between sequence, memory, and perception, to the surface. Upon returning to the States events that occurred in Italy only existed in my memory and by taking out select still frames from videos shot of day to day activities – it was if I was able to make my distant memories tangible. These memories then became transformed and manipulated once placed within the installation. 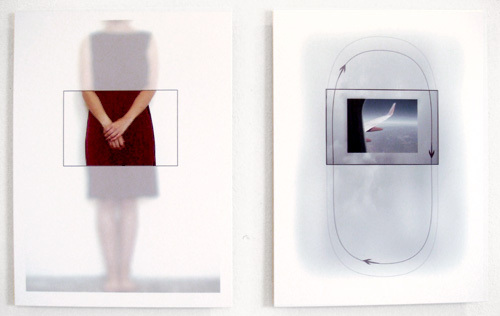 The installations were a visual representation of the process of memory. They were repeated and rearranged as memories often are. Each image was printed using a non-archival printer and then copied on the copy machine in order to emphasize their impermanent existence. The organic edges and fluid motion within each installation encourages the viewer to enter and exit anywhere within the piece – making their own journeys and connections within my own personal memories. ME: There’s a piece you created called “Within.” I’m hesitant to call it a landscape piece, but for lack of a better word, that’s what it seems to be. 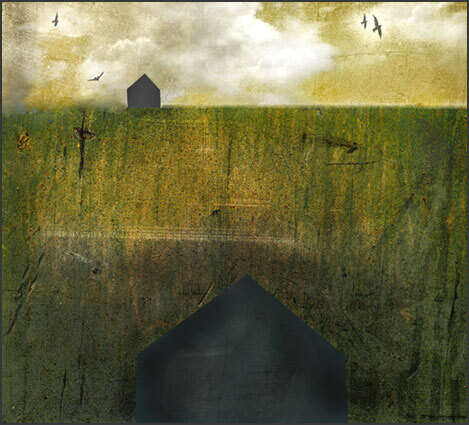 The birds, and the very simple house in this image, reoccurs in other pieces, like “Impact” and “Embrace”, all suggesting a narrative of some sort. There’s something dream-ish happening, giving the viewer a kind of floating out-of-body sensation. Would you say that’s a good description? Could you talk about this? JM: I would say that is an accurate description. The houses in these images represent individual lives. Our stories often unfold within these structures and to me home has always been a safe place to reside. Birds often find their way into my work as well, always representing the spirit or soul. The image “Within” depicts two house forms yet the placement of these forms within space is somewhat obscured. Whether you view them as being placed across a large expanse of land or as the smaller house existing on the surface with the larger house buried underneath – the fact remains that there is both a sense of separation and connection between the two. I think this is what I want the viewer to take away. On a more personal level, this work is about the passing away of my grandmother and the fact that her spirit exists within me. ME: Greif can be instrumental in creating new works of art. That has been my experience too. 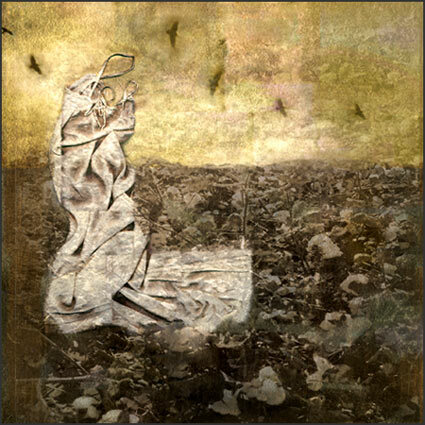 So again in “Sprit Fields” one, two and three, we see the birds reappear. They look like the same birds—crows perhaps–but now the house is replaced with a dress that’s moving about. Yet the dress is missing its wearer. Where is the person that would be wearing this dress, or is that the point…no person, just a spirit? JM: Correct again. 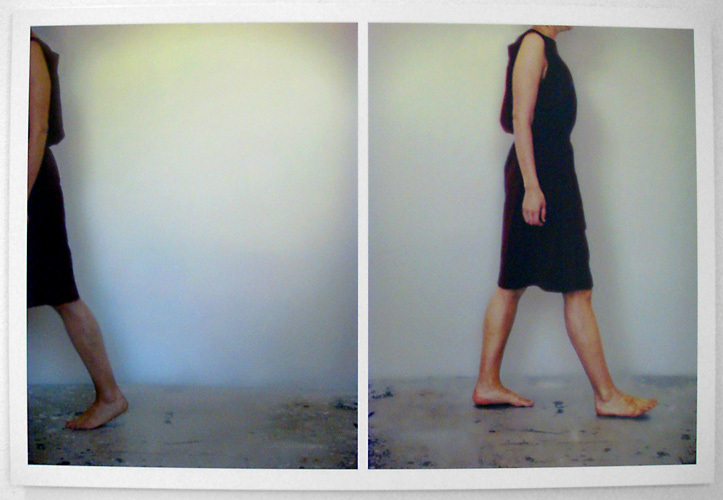 The dress references the body but the body does not exist – thus leaving us with the movement or the energy that exists within the body – otherwise known as the spirit. The term “field” can be thought of as a wide open space, often in terms of land but can also be used in reference to energy or things of a more intangible nature. I spent a while living in Tucson, Arizona after grad school and the vast expanse of earth and sky that surrounded me out there felt very spiritual to me. The “Spirit Field” pieces arose from this experience. ME: So, one of my favorite artists, Kandinsky, wrote this book years ago called “Concerning the Spiritual in Art.” And in your artist statement–on your website–you write about building up a physical vocabulary to aid in examining spiritual and psychological concepts. I’m comfortable speaking about this, but some people get a little skittish on metaphysical topics. Notwithstanding, how do you define the spiritual, and what place does it have in art? JM: I don’t know that I can define spiritual for everyone because I feel that is a very personal thing. However, I view it as being any experience that makes me aware of a greater power at work. Of course, this is all speaking on a very intuitive level. Since spirituality is so individualized and art is such a powerful subjective communicator – I believe that art is a perfect vehicle for spiritual connections and conversations. ME: In closing, I’d like to ask about a piece that’s a sort of wall sculpture, called “Chrysalis.” Looking at the photos online it’s hard to tell what this “soft sculpture” is made of. Could you describe the work—what it means? 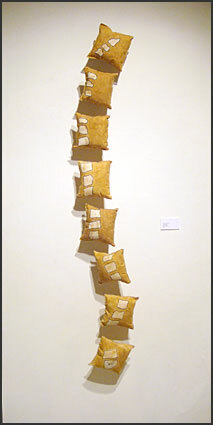 JM: “Chrysalis” is made of linen that I hand-stitched and dyed with tea. 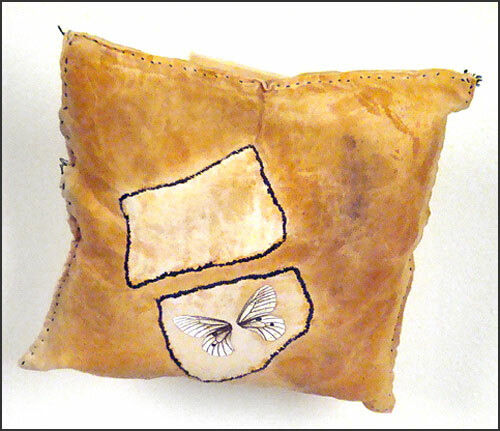 The only digital aspect of this work is a small digital transfer of a butterfly on the bottom pillow. I stitched an outline of part of a backbone on each pillow. I was drawn to the contrast between the strength of the backbone and the comfort of a worn pillow. We often times seek comfort in the strength of others and in difficult times if we look hard enough we can also find that strength within ourselves. I struggled with the title quite a bit on this one but finally settled on “Chrysalis” because the goddess Psyche in Greek mythology is represented as having butterfly wings. This visual lead me to make the connection between struggle, spirit, and transformation, which is what I was trying to get across in this piece. ME: Jessica, thank you so much for your time, and I wish you all the best in your career. JM: Thank you Max for all of the thought provoking questions. I wish you all the best as well. Additional images of Jessica Maloney’s artwork can be found in the AD MAG Artist Galleries, and a full 3-year archive of AD MAG articles and interviews can be found here. Digital Art: Medium or Metaphor? Digital Art has traditionally been categorized as a tool and as a medium. The software program, Adobe Photoshop, for example, is one of my favorite image making tools because of its unparalleled ability to manipulate and synthesize elements from different sources, allowing one to create something unique and cohesive. Digital art is also considered to be a medium, when the digital platform is used from start to finish. This is often applied to creative endeavors, which are time based, interactive and/or virtual. Ultimately, I’m not overly concerned whether people want to consider digital art to be a medium or not. Yet I do believe that it is true, that digital art does function beyond the constraints of a medium. But even more important than that being true, it is irrelevant. Even the asking of this question implies an outmoded way of thinking. Digital technology is blurring the boundaries between mediums, to extent that already many former, long-standing boundaries have completely lost their meaning. Whether something is a still image, moves, interacts with the viewer, has sound, or is only sound, comes down to the various choices in one’s digital toolbox, rather than examples of different mediums. This blurring of boundaries changes the approach to creative endeavors. Why? Because, a medium as traditionally defined has certain specific characteristics. In many respects, mediums are also defined by their limitations. Imagine this. Oil paint has a slow drying time and acrylic paint has a quick drying time. A painter who uses either of these mediums had better understand these qualities if he or she is to create a successful painting. An artist who creates a metal sculpture had better understand the limits of his materials before he or she installs a forty foot structure in a public area! Digital art (or digital technology applied to creative pursuits) functions beyond the constraints of a medium. And yet, digital art is made up of the placement of programmed ones and zeros. It has no inherent characteristics. If it appears to have characteristics at all, it’s because of current technological limitations. When we think of digital 3D animation, for instance, we might think of smooth geometricized figures–a kind of simplified realism with sophisticated lighting. If 3D animation seems defined by these characteristics, it’s because, given the technological limitations of recent year, this style of 3D animation could do well. Hence, due to such temporary technological limitations, this particular application of digital art has the appearance of a medium. We see this, recognize these qualities, and can then identify this work as digital 3D animation. Every day, software designers are developing better and better interfaces, working to eliminate or minimize barriers, and aesthetic imperfections. And every year processing power and file storage increase exponentially. Which suffices to say, that technical limitation in the digital art realm is always temporary…not an inherent characteristic. 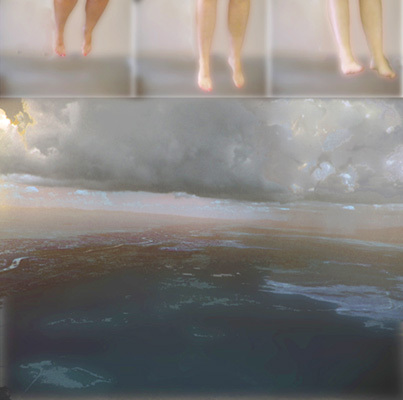 Without absolute limitations, I would suggest, digital art cannot have any characteristics. For, through evolution, it can look like anything. Consequentially, without any characteristics, I feel hard pressed to define digital technology as a medium. I considered (and many smart friends have suggested) that the ones and zeros–the digital information itself– could be the defining characteristic of a medium. Ultimately, I don’t feel like this is a satisfying conclusion. This digital information is the underlying structure defining any digital creation, but it is not perceptible in any practical way. We can only perceive the result of this invisible structure. As even when an artist is working directly in code, that person still utilizes digital information indirectly. Code and concept define the work, not the specific arrangement of billions of ones and zeros. This structure functions in the same way that atoms function in the physical world. Atoms are the underlying building blocks of the physical universe. They define everything but are imperceptible under normal circumstances. They make everything physical, including us, but we have no direct relationship with atoms. Instead, we have a direct relationship with materials, and when we apply one of these materials to art-making, we might consider it to be a medium. Ones and zeros to the digital world = atoms to the physical world. I believe this is a pretty self-evident analogy. If we accept this analogy and we also consider digital art to be a medium, then it would follow that atoms are the medium of the physical world. Clearly this does not define a creative medium in any helpful way. Although I find this a satisfying poetic notion with some truth in it, such an equation demonstrates a flaw in logic. We would consider oil paint to be a medium if we were to try to say that oil paint is a sub-category of the “atom” medium. However, we would have gotten pretty far away from any useful definition of a creative medium. And so it is with ones and zeros in the digital realm. There are non-material mediums. Television as traditionally defined is a medium, for example. Television is not materially based, but it still has specific and defining characteristics. Though, these characteristics may soon change to the degree that we either redefine the medium of television, or give the medium a different name. An important thinker in digital technology is Pranav Misry. In watching this linked video from 2009, where he presents at a Technology Entertainment Design (TED) forum, one can grasp a vivid illustration of the potential (and future application) of digital technology. Misry’s TED lecture offers an opportunity to see the seamless and intuitive way that the digital and physical worlds will be integrated in the near future, when the boundaries between atoms and ones and zeros continues to blur, until they become irrelevant, substantiating my belief that it will become increasingly useful and obvious to recognize that digital technology functions beyond the constraints of a medium. Fully realizing the enabling potential of digital technology requires fluidity of thinking. It requires the ability to consider the potential relationships between elements rather than subdivide them into increasingly arbitrary categories. This, of course, echoes the creative process itself. Interestingly, in spite of all this change, there are no new visual elements. We continue to work with line, shape, color, etc. Digital technology simply provides new and unprecedented ways to combine and synthesize these elements into something unique and personal. SCOTT LIGON, the author of “Digital Art Revolution, Creating Fine Art with Photoshop” (Watson-Guptill/Random House) is an award-winning digital artist who frequently lectures on the subjects of creativity, filmmaking, and digital art. Ligon is the coordinator for the digital foundation curriculum at the Cleveland Institute of Art. And he is also the author/director of the short film Escape Velocity, winner of “Best Experimental Film” at the USA Film Festival in Dallas, which has played in theaters and festivals worldwide.